Broadcom had new hardware and software to show off at MWC, one reference design and two demos respectively. Of the two, the software was more interesting because of where it is headed. 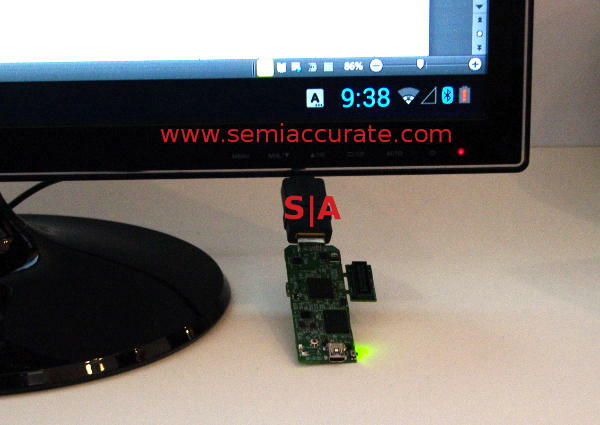 If you recall there were only a few things SemiAccurate found interesting at CES, one of which was an HDMI dongle with an Android PC dangling from the dongle, daringly. No grumbling, you would have made the same pun if you could have and you know it. [Editor’s note: No we would not.] That said, Broadcom showed off the reference design below based on their 28155 dual A9 SoC. So far, other than the 1080p capability, this is mostly a yawner. Before you ask, the thing on the right side is test and debug hardware that won’t be there on production devices. As I learned after I immortalized in print how new the Ingenic non-dangling dongle was at CES, it was not a new idea or anything unique, there are a lot of companies doing HDMI ARM PC dongles. The Broadcom design is unique because it has a 2G/3G modem with HSPA+ capabilities built in, and that opens doors. Another feature I haven’t run across before is powering the device off MHL equipped panels through the HDMI port. This means no USB connection needed for power, but there is one for non-MHL compliant panels if you need to use it. It gets interesting from here in because the dongle dangles corporate functionality in front of you by incorporating a full Citrix client on it. If your company uses Citrix for remote connectivity, this dongle is a full secure corporate client device in your pocket. Remember the HSPA+ modem? Think about that when you are at a site without a data connection, it could be very useful to have. As you would expect, the rest is pretty vanilla, Wi-Fi, Bluetooth, and 2GB of flash, all plenty for what you need to use this for. Next up was a demo for a feature called Ambient Light Compensation Engine (ALCE) that is software/firmware based in the current Broadcom Video Core IV GPUs. In the next version, moles suspect it will be called Video Core V, ALCE will be baked in to the hardware. The results are pretty easy to describe, it makes games and videos appear brighter and better looking while using less power. Broadcom was showing this off with two identical phones that use their chips hooked up to watt meters. How does it work? It looks at the image being rendered on a pixel by pixel basis and jacks up the brightness on areas that need higher contrast. This gives things that need more definition a higher contrast ratio to the pixels beside them without the higher brightness so they look better and brighter. How this worked exactly was obviously not disclosed, but it does seem to work. If it saves about 15% of the total phone power while running in software, once it is baked in to hardware, it should be even more beneficial.